Working closely with our product partner HIMA, SELLA CONTROLS has the expertise to provide tailor-made solutions, ranging from stand-alone units to complete systems integration. HIMA is the European market leader in safety-related process automation and has become internationally acknowledged for its expertise by virtually every major company in the process industry. The HIMA Programmable Electronic System (PES) is TUV certified, please download the full TUV report. HIMA products include the award winning H41q/H51q HIQuad, together with the HIMatrix, Planar4 and the recently launched HIMax. Download HIMA’s recently launched Process Safety brochure. HIMax is a flexible platform for large, critical production processes that you can never afford to have go down. HIMax adapts to all I/O-count, response-time and fault-tolerance requirements as well as centralised and distributed applications. HIMax delivers availability for life by enabling uninterrupted system operation throughout your plant’s lifecycle. Hardware and software changes can be performed without system interruption. Download the full HIMax Systems Facts. Developed for applications requiring a few I/O points to several hundred I/O points, HIMatrix features cost-effectiveness and big-system performance. 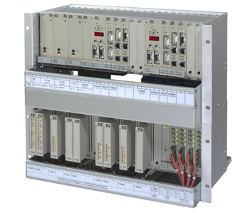 Ideal for networked and time-critical applications, the HIMatrix series of safety-related controllers and remote I/O modules delivers excellent system performance, compactness and easy assembly. Devices with enhanced performance offer PROFINET, multitasking, SOE recording and reload capability. Download the full HIMatrix Systems Facts. Designed to provide maximum guaranteed safety, HIQuad solutions are an ideal choice for small and mid-size safety-critical applications requiring high levels of process availability. HIQuad solutions are available with different combinations of scalable availability at the I/O and CPU level. HIQuad systems are extremely flexible and can be easily adapted to all application requirements. Download the full HIQuad System Facts. Planar4 systems integrate inputs, logic processing and outputs on every module. The application-specific programming of the systems is accomplished without software, but instead with various wiring techniques such as solder, Termipoint or Wire Wrap on the backplane bus board. All modules can be used in a redundant structure in order to increase availability. Download the full Planar4 System Facts.